In previous posts about bunny colour genetics I’ve talked to you about the Self colours of Black and Chocolate and their dilute representation in blue and lilac, respectively. I’ve also talked to you about the Agouti gene, the dominant gene in bunny colour genetics that reminds us of the wild bunny colouring. You can understand bunny colour genetics better if you remember that each gene expression on the bunny DNA has both dominant and recessive traits. If a dominant gene is present, it will be visible over a recessive gene. These dominant colour genes also have a respective recessive genes. These are notated with a lower case letter, to show that they are recessive to a matching dominant gene. Every bunny receives two colour modifiers for A through E, one contributed from each parent. However, only the dominant modifier will be expressed, although the bunny may pass on the recessive gene to its offspring. It is nonagouti, Black, with full colour saturation, with nondiluted colour, and with colour that goes down the hair shaft. In this bunny there are two gene markers that remain dominant — the C for colour saturation, and the E for colour extension. 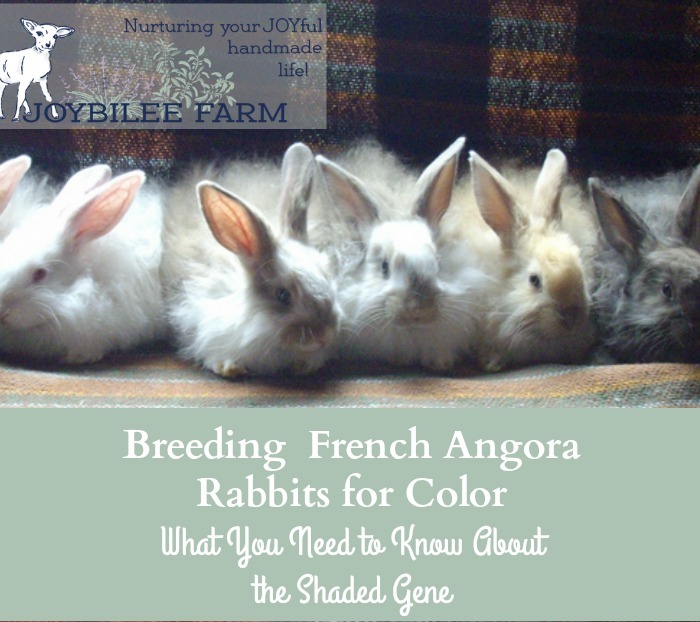 These are the two gene markers that are responsible for the myriad shading possibilities in all rabbits. Lets look at the colour extension or E gene first. The E gene is responsible for whether the bunny shows as a black or chocolate rabbit or as a fawn or torte rabbit. The recessive ee genetic marker gives the rabbit a golden or orange fur colour, in spite of his other genetic markers. It is considered a shaded gene because rabbits that carry this gene will have shading on the face, ears, and flank. The shading is usually of the colour expressed by both the Bb and the Dd — genes. Tortoise Shell Bunnies are self bunnies with the recessive ee shading gene marker. Tortes can be Tortoise Shell (aa, B_, C_, D_, ee), Chocolate Torte (aa, bb, C_, D_, ee), Blue Torte (aa, B_, C, dd, ee), or Lilac Torte (aa, bb, C_, dd, ee), depending on their individual phenotype. 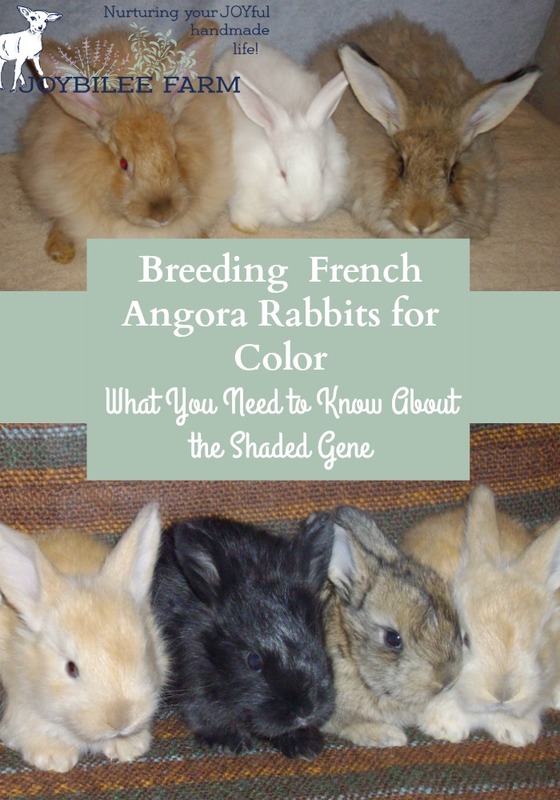 The phenotype is the expression of all colour gene markers in an individual rabbit. Recessive genes are known, but since dominant genes are visible and mask the paired recessive gene, one cannot know what the other gene is, in a gene pair, until the bunny has offspring. When a Tortoise shell is bred to a self rabbit, think of the Tortoise shell rabbit as being genetically a black rabbit. A breeding of a Tortoise shell (aa, B_, C_, D_, ee) with a Lilac self rabbit (aa, bb, C_, dd, E_) will give Black, chocolate, blue, lilac, and tortes of each of these colours). Of course every litter will be different. Each parent will contribute 1 gene in each of the Gene markers. There will be no agoutis in the litter. A fawn rabbit is an agouti rabbit, with the black colour genetics and the shaded ee gene marker. Its phenotype looks like this: (A_, B_, C_, D_, ee). When bred with a self rabbit, at least half the babies will have the agouti gene. When a fawn rabbit is bred with a torte, 100% of the offspring will be either fawn or torte. The recessive ee genetic marker will turn the coats of all the offspring orange, with shading of the Bb colour on face, ears and flank. 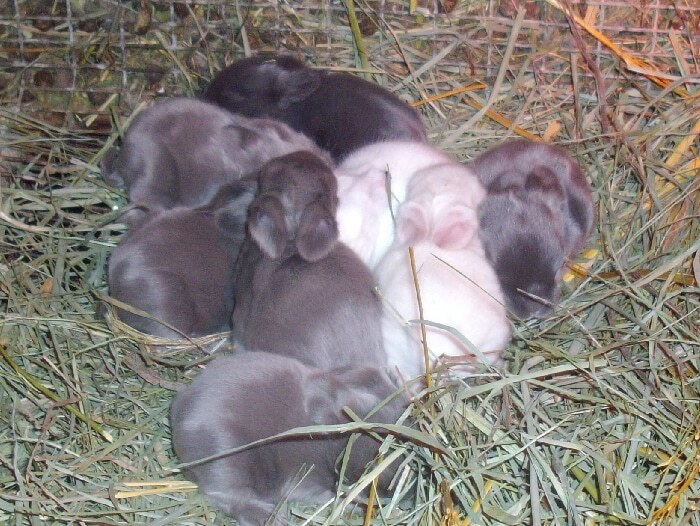 Since the fawn rabbit has the same B gene marker as a Black rabbit, a pairing of a fawn with a self rabbit such as a lilac rabbit (aa, bb, C_, dd, E_) may give black, blue, lilac, and chocolate self, chestnut, chocolate agouti, opal, or copper, as well as fawn, and tortoise shell, chocolate torte, blue torte, or lilac torte. Its a good breeding if you are trying to expand the colour choices in your rabbitry, for your own spinning pleasure. 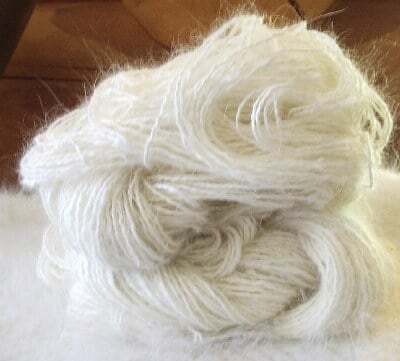 Fawn and Torte are one of my favourite colours to spin and use in knitting or weaving projects. 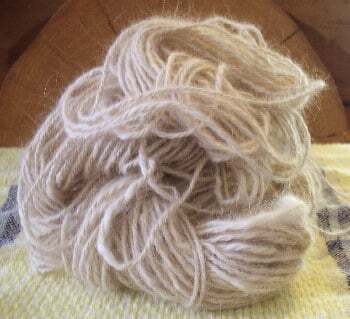 The yarn is a creamy colour but the halo is reddish orange and looks stunning with autumn complexions. 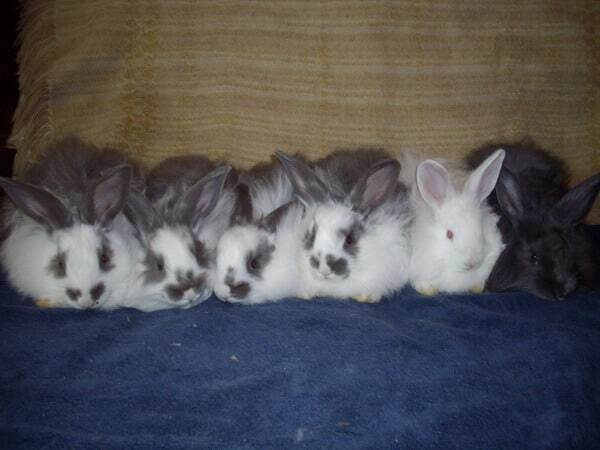 Regardless of the bunny colour genetics the resulting yarn from all these rabbits will fall into one of four basic colours: white from a Ruby Eyed White rabbit, Cream/Orange from a torte or fawn rabbit, cool grey, or warm grey. The other colour that the E gene marker expresses is the steel colouring. Always seen in conjunction with an agouti gene (A_), this causes the colour on the hair shaft to be ticked with tan or silver. It is written as EsE on the phenotype. Those bunnies ticked with silver also carry the chinchilla genetics on the C marker, expressed as cchd. So putting it all together, a silver steel rabbit has the phenotype: A_, B_, cchd, D_, EsE – -this tells you it is an agouti rabbit, black, with the chinchilla gene, nondilute colour, and steel shading. Now lets look a little closer at the C_ genetic marker. This is the marker responsible for full colour saturation. This is the most complex of the genetic colour markers on rabbits. It expresses where and how much colour is expressed on an individual rabbit. There are 5 different sets of C or c genes possible in rabbit phenotypes. Listed in order of dominance they are: C_ for full colour saturation; cchd for chinchilla markings, as in the above steel rabbit; cchl or sable shading, which is also called light chinchilla; ch which is the Himalayan shading of tipped ears, a face mask, and tipped paws — much like a Siamese cat, and cc which is a complete absence of colour as seen in albino rabbits. The cchd genetic markers remove the yellow pigment from the hairshaft on Agouti rabbits. These rabbits are chinchilla colouring and can be Chinchilla (A_, B_, cchd_, D_, E_), Squirrel (A_, B_, cchd_, dd, E_), chocolate chinchilla (A_, bb, cchd_, D_, E_), or Lilac chinchilla (A_, bb, cchd_, dd, E_). The sable shading, cchl, shows up exclusively in nonagouti rabbits. Also called “light chinchilla, ” it shows up as a dark shading over an already dark coat in sable rabbits (aa, bb, cchl_, D_, E_) or dark sable rabbits (aa, B_, cchl_, D_, E_). Pearl rabbits also express the sable shading. These rabbits are exquisitely beautiful with their shading in 3 shades of grey over their bodies. Smoke Pearl (aa, B_, cchl_, dd, E_) have guard hair over back and normal furred areas in dark smokey blue. 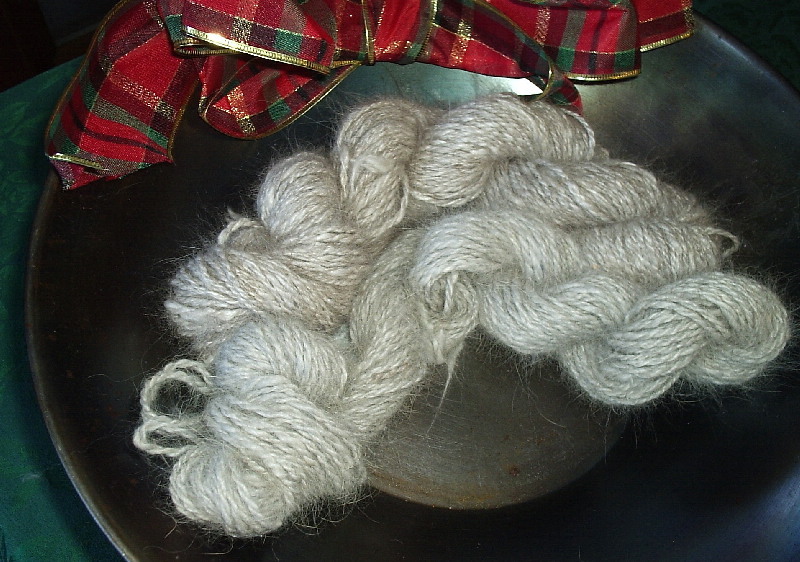 Wool on head, ears, feet, upper side of tail, and back is medium smoky blue, shading to lighter pearl grey beige on chest, flanks, belly, and underside of tail. Rabbits carrying the sable shading can be seen in the reddish cast of their eyes, when a glint of light shines on them. Sable rabbit will often appear to change colour from 2 to 4 weeks and growing to their adult coat. It is not unusual for a sable rabbit to appear as a blue rabbit in the nest box, only to mature to an almost black coat in adulthood, but genetically the rabbits are different from a black rabbit, and this will be seen in their off spring. The ch marker is the Himalayan marker which makes a white rabbit with colour markings on the points of black, blue, chocolate, or lilac. 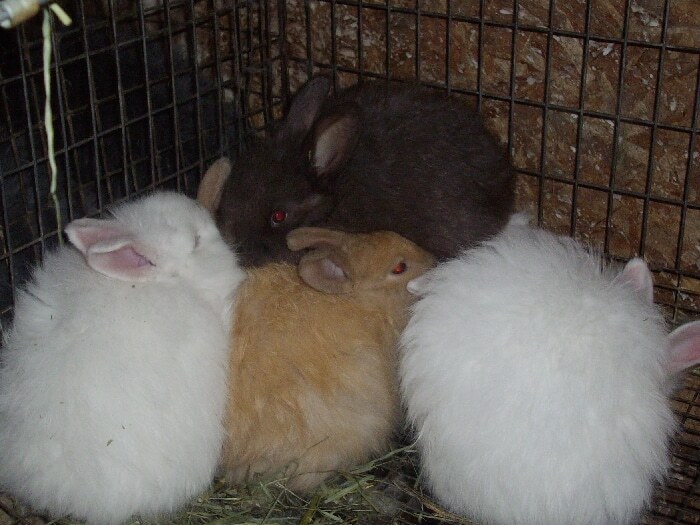 These rabbits, like albinos, always have red eyes. Also called pointed white, they have the same genetics as a self bunny, but with the ch_, marker in the C colour genetic spot. So a Black pointed white will have the phenotype: aa, B_, ch_, D_, E_. The final C colour saturation marker is the most recessive, the cc marker or albino gene. The albino gene masks all other genes that the bunny is carrying . 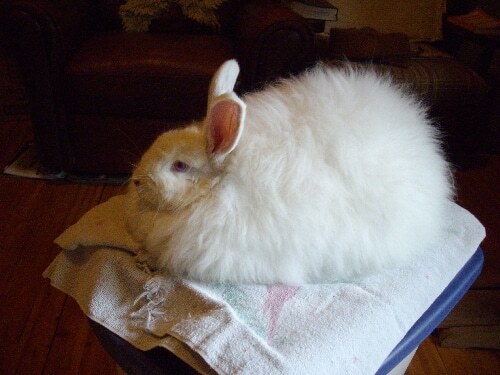 So all albino rabbits have the phenotype: _ _, _ _, cc, _ _, _ _. When two albino rabbits or Ruby Eyed White rabbits are bred together 100% of the offspring will be ruby-eyed white. The other genetic colour markers are masked by the albino gene and one cannot tell what these bunnies are carrying unless one has access to their pedigree, which will give a hint. Breeding an albino rabbit to a self rabbit will give you a better idea of their complete genotype. I had an albino male whose background was a mystery. Although I had a pedigree for this rabbit, and I owned his mother a REW bunny, she came to me already bred. Once I began to use him for breeding, I discovered that he carried the spotted gene (Enen). This was a bonus to my breeding program, as my spotted female was older and had stopped bearing. I was hoping to expand the spotted genetics. More about that in the next instalment. I just bought a lilac and i learned that one of the parents was a lilac chin. Im wandering if that would make the lilac i bought a lilac chin as well since it would carry the cchd gene. I read that a lilac chin is just lacking the agouti gene to make the chinchilla. Im new to rabbits and trying to learn the genetics. So glad I found these articles. Generics stumps me. Though I caught allot of what you explained, so much is still.over my head, however, no one has ever explained it clearer than you. I have hope more I might grasp it someday. Thank you! Thank you so much for this series. It has been so helpful, the bunnies we bought off you last year just had their first litter and this has been so helpful identifying the little one. They are now 13 days old. Thanks. Congratulations, Katrina. That’s so good to hear of your successful litters. Thank you for the blog–the information is great! I got bunnies from you last year and they are healthy, good-tempered beauties. I loved your potato chip recipe–i’ve been looking for one for a while. Thanks for shining the light for us! Its great to hear from you Sam and to hear that the bunnies are doing well. Still learning about potato chips and home made treats. Glad to share as I go.